Well, my semester project took a full 180 after messing around in the Fab Lab a second week…the place seems like it oozes creativity. 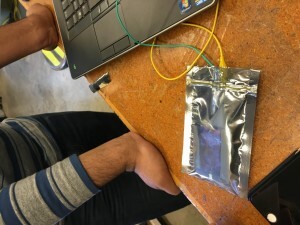 After learning how arduinos work, I decided to start helping Stephen, Andrew, Toheeb, and Pri with the pressure pad for their wheelchair smart glove idea. It is a really interesting concept that is constantly evolving, but basically we are trying to pair an accelerometer with a pressure pad so that the wheelchair racing team can gather data on touches and speed to see how to race more effectively. After just meeting together in the lab that one day, I can tell that we will work well together. 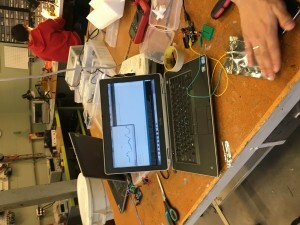 Going into the lab with no knowledge of arduinos, and teaching ourselves in a matter of hours how to make a pressure sensor makes me think that we will be able to do some pretty big things with the project. I am excited to get back in the lab tomorrow, and use the sewing area so that we can figure out a way to sew the sensor into the glove…..Also I ripped a hole in my backpack this weekend and I am going to attempt to patch it up myself. Lastly, if you are reading this and not following me on twitter, please follow @NickHans55 because myself account for this class still only has 3 followers! This entry was posted in Reflections, Week7 by Nick Hansen. Bookmark the permalink. I still haven’t worked with Arduinos in the FabLab! The pressure pad that you are developing sounds incredibly cool and that you guys didn’t have any prior knowledge on how to work the software shows that such technology is becoming more hands-on and accessible to the general public. Good luck with your project! Hi, I really like the fact that you guys are trying to help the wheelchair team. I would also like to add some other features to my project – adjustable cup holder so it can benefit more people.